Florence is a city of immense artistic richness where, around every corner, you will find elegant piazzas, Renaissance palaces, beautifully constructed parks and towering churches. This morning, check into your charming hotel in the center of Florence, complete with a roof garden overlooking the iconic Arno River. Your guide will meet you and take you on a walking tour that will introduce you to the city’s most important monuments, piazzas and streets, while telling you about the origins and history of Florence as it has evolved over the centuries. Start at the Ponte Vecchio, the bridge that crosses the River Arno. Completed in 1345, Ponte Vecchio is the only bridge that survived World War II, when the retreating German army destroyed the other bridges over the river. 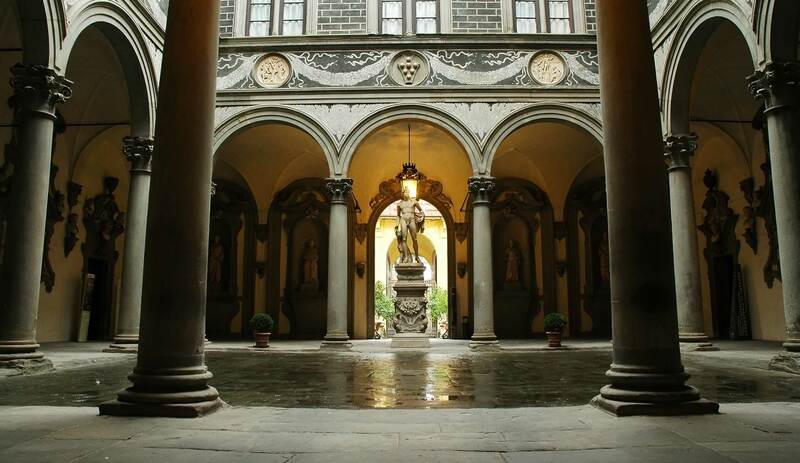 Learn about the fascinating passageway crossing over the bridge that enabled the Medici to walk in grand style from their offices in Piazza della Signoria to their home in Palazzo Pitti. Continue to the Piazza Signoria with its incredible open-air gallery of original statues and learn about Florence’s political history, including how the Medici family became so powerful. Walk down the bustling Via Calzaiuoli to the Cathedral Square and visit the Baptistry, the oldest religious building in the city, which still maintains its original 13th century mosaic decoration and magnificent guilded bronze doors. Gaze at Brunelleschi’s awe-inspiring Dome of the cathedral and discover how he managed to build such a masterpiece. You will end your day with a visit the Gallery of the Accademia. Here you will view works by Michelangelo, including his world famous David sculpture. The Accademia also houses a significant collection of paintings, including Botticelli’s Madonna and Child, and a number of early 13th century religious works. Begin your day today with a visit to the district of Santa Croce. 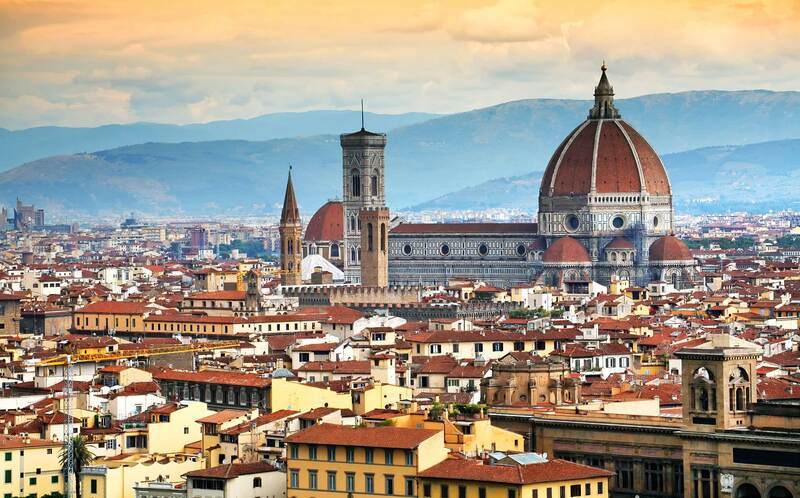 Florence remains divided into four main neighborhoods, named after the religious complexes built in centuries past. Your first stop is the Church of Santa Croce, part of the monumental monastic complex built by the Franciscan community in the 14th century. Often referred to as the Florentine Pantheon, Santa Croce houses the tombs of a number of great Florentines, including Michelangelo and Galileo, as well as masterpieces by Giotto, Donatello and Brunelleschi. Continue on to a nearby workshop where the artisans still create Pietre Dure, Florentine mosaics using traditional techniques to make exquisitely crafted designs in colored marble and semi-precious stones that sometimes take years of work. End the morning in the Bargello, the oldest civic building in Florence, used as a prison during the Medici period, and, after years of neglect, restored into a beautiful museum. It now houses a major collection of Renaissance sculpture with works by Donatello, Luca della Robbia, Michelangelo and Giambologna, as well as a number of fascinating smaller collections of precious objects donated by private collectors. The building itself, with its medieval architecture and decoration, make this museum especially fascinating. This afternoon, transfer by private car to Fiesole, a small town on one of the hills overlooking the city, that is dotted with famous villas and gardens. Here the Etruscans founded the very first city in the Florentine area. You will visit the archeological site where there are still remains of an Etruscan temple, as well as Roman baths and a theatre used for summer concerts and opera performances. The views over the surrounding countryside are stunning. You may also wish to visit the small archeological museum that houses some of the artifacts excavated in the area. Return to Florence in time for dinner this evening. We will provide you with a list of restaurant recommendations. Start the day with a guided walk through the lively central market of San Lorenzo, where the locals shop for fresh produce of all sorts, and learn about Tuscan food while feasting your eyes on the magnificent displays of fresh vegetables, cheeses, wine and olive oil. Continue the morning with an introduction to the history of the Medici Family, beginning with a visit to the Church of San Lorenzo that was patronized by the Medici and re-designed for the family by Brunelleschi. Continue to the Medici Chapels to see the sculpture and architecture Michelangelo designed in the New Sacristy for the Medici family tombs, left unfinished when the artist left Florence for good in 1534. You will also visit the Laurentian library, designed by Michelangelo for the Medici Pope, Clement VII. Next you will visit Palazzo Medici Riccardi, the Palace that the Medici commissioned in the early 15th century, which became a model for all subsequent Renaissance palaces in the city. Here you will see the exquisite Chapel decorated with frescoes of the Procession of the Three Kings in which the artist included numerous Medici and other contemporary portraits. After a break for lunch, continue your day with a visit to the Uffizi Gallery to see the world-class collection of paintings that was started by the Medici and has continued to evolve since the Medici family died out in the early 18th century. The Uffizi is the oldest museum in the world and houses the world’s most important collection of Renaissance painting. The gallery is home to masterpieces by Giotto, Filippo Lippi, Piero della Francesca, Botticelli, Leonardo, Michelangelo, Raphael and Titian. Today you will continue your discovery of Florentine neighborhoods, crossing over the river into the Oltrarno district. Oltrarno, which literally means “beyond the Arno,” defines the areas around the churches of Santo Spirito, Santa Maria del Carmine and San Frediano, as well as the Pitti Palace. Considered by many Florentines to be the “real” Florence, this area is much less visited by the crowds of tourists that pack the main streets and squares on the other side of the river. Its narrow streets and alleys are lined with local shops and artisans’ workshops. Start with a visit to the Brancacci Chapel in the Church of Santa Maria del Carmine, which was frescoed with stories of the Life of Saint Peter by Masaccio, Masolino and Filippino Lippi. It is considered the most important fresco cycle of the entire early Renaissance and was studied by many subsequent artists, including Michelangelo who earned a broken nose here when he got into a fight with another artist! Continue to Piazza Santo Spirito where there is a lively daily market locals frequent for fruit and vegetables as well as clothing and household goods. The Church of Santo Spirito, designed by Brunelleschi who, unfortunately, did not live to see its completion, is a magnificent example of his architecture. Finish this morning at the Pitti Palace where you can choose either to visit the Palatine Gallery, which houses a major collection of High Renaissance and Baroque works by Raphael, Titian, and Rubens among others, or go into the Boboli Gardens, created by the Medici in the 16th and 17th centuries, that stretch out behind the Pitti Palace. This afternoon is yours to continue exploring or shopping on your own. This morning, transfer to the airport by private car in time to meet your departure flight, or continue on to your next Willing Foot destination.